hockinsk wrote: I've read this thread a few times, but no mention of what is physically different between a real and a fake A-Bike? Only discussion seems to be stickers and perhaps build quality, but what are the actual differences in materials & components please? Actually, it is difficult to differentiate genuines and fakes by a galance. You can only differentiate them by workmanship, built quility and markings on the frames. However, the plastic parts used on fakes are much brittler and weaker than those used on genuines. The quality of aluminium parts used on fakes are also lower than genuines. OK, so I bought an "A-Bicycle" knowing that it wasn't a real A-Bike. My thinking was I didn't want to fork out AU$500 without at least having a test ride. So, I spent AU$70 over eBay. Ben Royston, Design Engineer at Mayhem UK tells you how to differentiate genuine and fake A-bikes. When I was riding my copy A-bicycle I noted this cracking on the rear tube as well but used a method to repair it. I just placed a hose clamp around the damaged to stop the crack from growing. It never got as bad as your bike. I think that the original A-bike has had this happen as well. It is the the way the part is designed and made that could be causing the problem. There is a great amount of stress in that area of the from. It has ben a while since I was on this site so it is nice to be back. Given that the bike is lighter then a regular bike, one most take care when using any of these bikes. elucid8 wrote: OK, so I bought an "A-Bicycle" knowing that it wasn't a real A-Bike. My thinking was I didn't want to fork out AU$500 without at least having a test ride. So, I spent AU$70 over eBay. elaine wrote: I have one that I just bought from a local. It has none of the markings discussed. Is it real? It's a fake A-bike definitely. Did you determine this from the picture or from Elaine noting the missing markings? I wonder if it's possible to determine authenticity by using pictures alone. 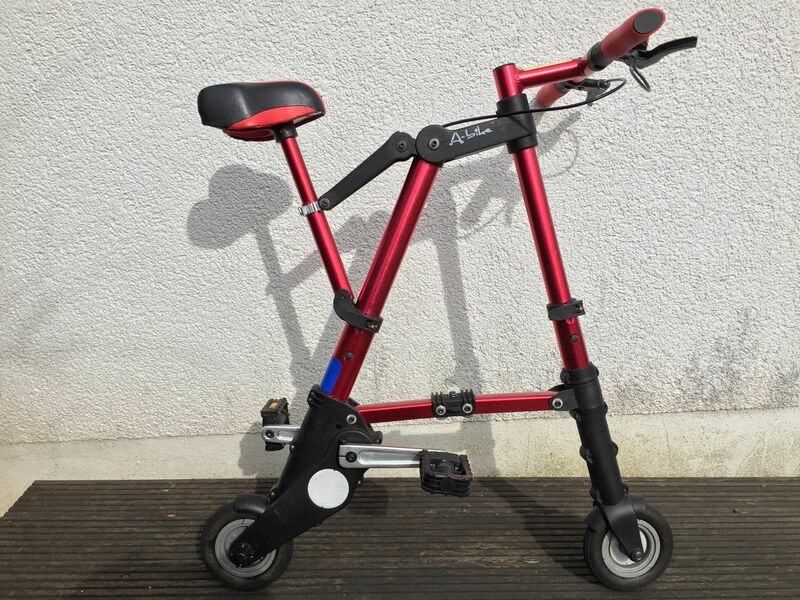 I currently have an eBay-purchase pending for a (supposedly) original A-Bike. This is the link to the auction: http://www.ebay.at/itm/Orig-A-BIKE-Mini ... 1371520469 (ignore the German description). The seller seems to think that it's original. I don't know which model it is. It doesn't seem to have the a-bike.net and Sinclair markings on the side of the middle bar. Is this a fake? P.S. : I wanted to add, I read through the whole thread and tried to apply all of the tips mentioned here, unfortunately without a conclusive answer. P.P.S. : Hi everyone, I'm jctan, new to the forum, and possibly new A-bike owner. 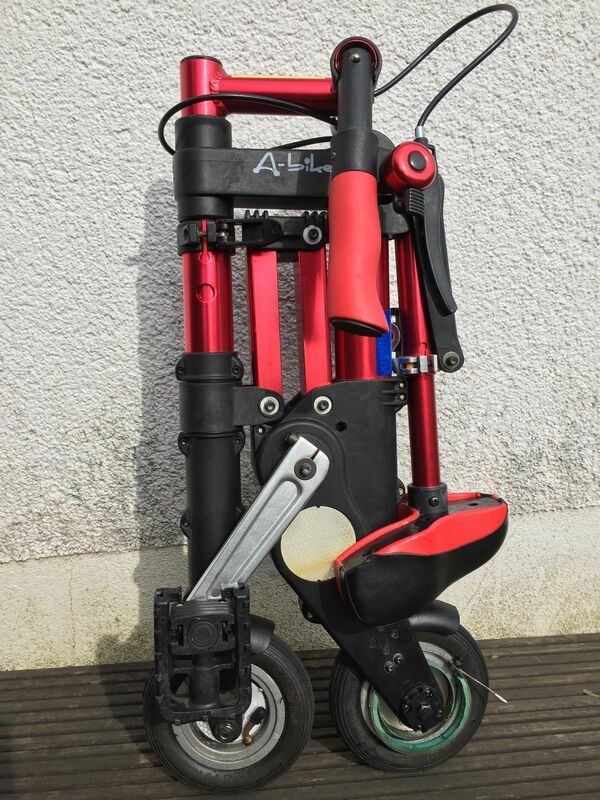 I'm already a Brompton owner but looking for something smaller and more portable. The "A-bike" on the pictures you posted is fake. Here is the post related to genuine 8" wheeled A-bike City for your reference. I recently bought a bike on craigslist that claimed to be an early A-Bike. They were not the original owners and did not even know how to set it up. I was disappointed that they did not have the owners manual or carrying case. Also, I was surprised that the bike said "unique bike" on the part of the frame that usually contains the "A-Bike" logo. Was there a cheap imitation sold under the name "unique bike?" Does anyone know the history of this bike? I'm sorry for some reason my post showed up 4 times and I could find how to edit or delete the other 3. I have another question: I see an electrified A-Bike with 10 inch tires. Is this another fake or is there a real 10 inch wheeled A-Bike, that can be electrified? Yes, they are all fake. Tires are Qing-Da, already mentioned here before. Well mine (pedal only) was bought in OZ in January 2018. Both wheels are eccentric so naturally are the brake drums. Cannot stop the brake bands from rubbing. How hard is it to make a wheel properly? I've let the rear brake off completely and it still manages to rub the friction material each rev. I am disappointed & I haven't even tried to ride it! PayPal does not give any contact info either. I have a high regard for British goods so it doesn't come from there. It is a fake! !